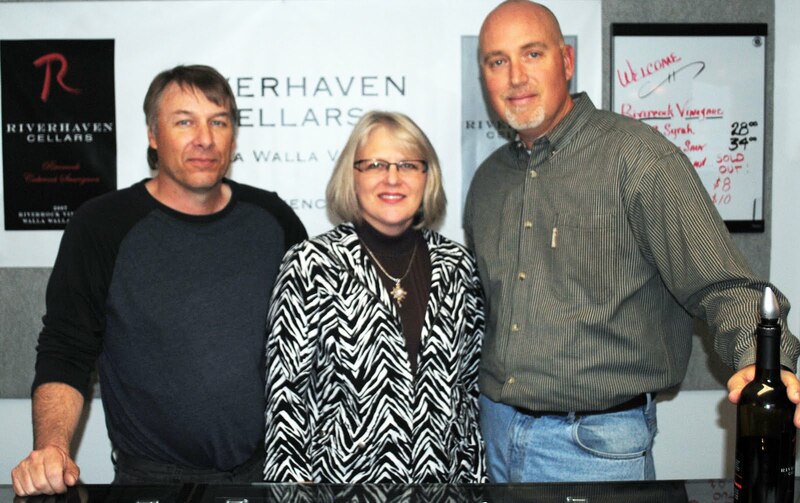 Riverhaven Cellars is a new Walla Walla winery. The winery is a showcase for its estate vineyard, Riverrock. 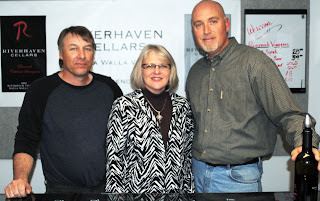 Riverrock Vineyards is located in the southern section of the Walla Walla Valley American Viticultural Area (AVA). This area, part of an ancient riverbed, has seen tremendous growth in the last five years following Christophe Baron’s success with Cayuse Vineyards. Commonly referred to as The Rocks, I prefer to think of this as the ‘occupied area’ of the AVA. Riverrock is owned by three couples, Greg Elliott and his wife Nel Gerig, the Imhoffs, and the Wheelers. Elliott says of the decision to start a vineyard, “We are all wine lovers, so when the opportunity came around to purchase forty acres in the Walla Walla Valley, we jumped on it.” In addition to grapes, apples, cherries, and peaches are also farmed at the site. Riverrock was planted in 2001 to fifteen acres of Cabernet Sauvignon, Syrah, Grenache, Merlot, and Cabernet Franc. An additional ten acres were recently added. Dana Dibble, who is also a minority partner in the business, manages the vineyard. Riverrock sells grapes to Buty, Rulo, Skylite, Sojen, Trouvaille, and Furion. After the positive response to the vineyard’s grapes, Elliott and his partners decided to start a small winery focusing on Riverrock’s fruit. Potential trademark issues led to the use of the name Riverhaven instead of Riverrock. 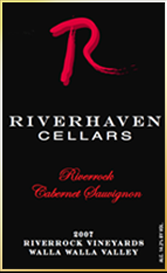 Riverhaven had its first vintage in 2006 with an estate Cabernet. The winery added Syrah in 2007 and will be offering Grenache in the near future. The winery has used a consulting winemaker for its initial releases. Don Redman of Mannina Cellars made the wines from the 2009 vintage and will be doing so going forward. The winery’s tasting room is in downtown Walla Walla, adjacent to Skylite Cellars. Riverhaven produces 500 cases annually. Rating: * (Excellent) Abundant cedar notes, dust, chukar cherries, and earth on an aromatic nose. On the palate, tart, polished and filled with cherries accented by subtle oak flavors. A call out to Bordeaux. 100% Cabernet Sauvignon. Aged 20 months in French oak (20% new). 14.2% alcohol. 300 cases produced. Rating: + (Good) A moderately aromatic nose with light blueberries, raspberries, dust, cedar, and earth. On the palate, clean and well balanced with very pretty fruit flavors. 100% Syrah. Aged 20 months in Hungarian oak. 14.4% alcohol. 150 cases produced. Some winery quirks: (1) two wines offered, a total of 450 cases. What are their full-time jobs? What are the short- and long-term goals of this winery? (2) What's up with touting the awards from some Finger Lakes deal? Is it supposed to mean something? And (3), a wine club already? I have not seen their labels in the stores, so they must still be self-distributed? I hope they do well. Come to think of it...that guy on the right in the picture...is that...is he...Goldberg? ?